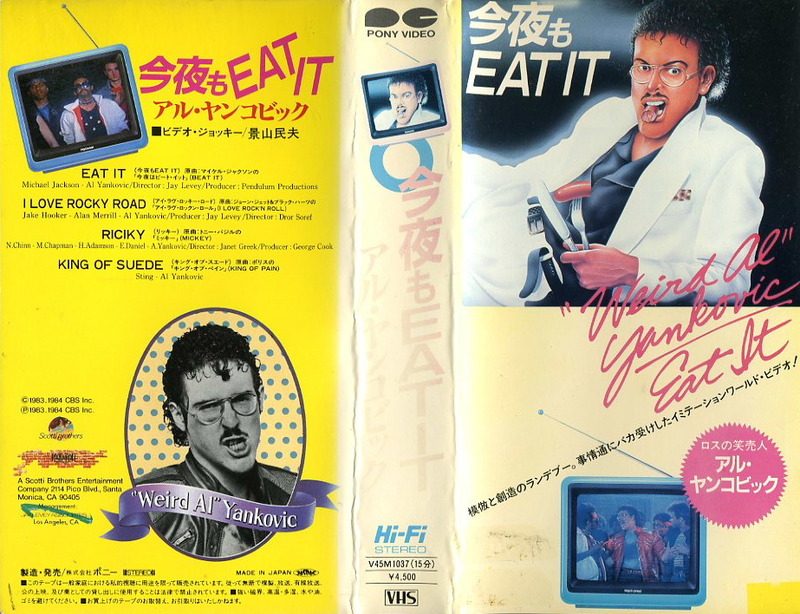 Wow, I can't remember if I knew about that japanese Eat It video (I recall looking at every page on the rare stuff section back in 2000, so if info was there then then I have read about it). And it's from 1984? I thought The Compleat Al was the first commercial video release of Al's music videos. I wonder why they only did a photo gallery montage of one song (not enough photos to use?) as opposed to including Ricky. weird user wrote: I wonder why they only did a photo gallery montage of one song (not enough photos to use?) as opposed to including Ricky. I'm really interested in this video. I've been looking around for it on Japanese auction/retail sites and only found a page on Buyee (a service that lets people outside of Japan buy from said sites) that was indexed by Google but no longer exists. I did do a quick search in Japanese(well, I'm Japanese) but I did not find a stock other than the rental site you posted. Someone seems to have sold one on Yahoo Auction while ago, but the page is gone. ...Maybe I'll try renting it to confirm what the video is like. If you can rent it, yes, please do. Is that a trustworthy rental site? I assume so. It seems to be a very small company, but it specializes in collecting/preserving out-of-print video tapes. The tape itself says that there is no video for KING OF SUEDE due to "Yankovic was touring" but instead there are new photos. Tamio Kageyama, a popular TV script writer around the era, is credited as video jockey/lyric translation. Man that's cool! You sure your VCR works? King Of Suede video is indeed a slideshow(photos + corny transitions) and it's not full length - just about 1 min long. It starts with the single cover pic then shows pics like Al in studio playing keyboard(with his leg behind his head), several on stage pics(one looks like the set of I Lost On Jeopardy - Welcome To The Fun Zone), and typical(?) Al in Hawaian shirt artist profile pics. For some reason there are 4-5 pics of Al on phone pics(from slightly different angles). If you have any way of uploading it (with the introduction and ending), that would be amazing. Any of the Tamio content would be interesting to see, even if I wouldn't understand it. Either way, thanks for finally solving a longtime Al mystery!